At tonights full Council meeting MP hopeful Jim McMahon said that Labour Oldham Council won’t stand for any more Government cuts affecting their deprived communities, of course it is all very well and commendable to defend the poor but when that poverty is created, maintained and expanded by socialist policy and doctrine then it is quite contemptible. Labour Oldham spending and debt creation has been and continues to be disproportionately targeted in these deprived areas while year on year the Council accomodates and panders to endemic multigenerational worklessness and an ever increasing poor migrant population with barely a mention of the continuing scale and costs of this imported poverty and that is without including the 600 asylum seekers currently dumped upon a struggling Oldham by the Governments contractors. Nobody signed up for this not the people born here nor the migrants and their families from the 1950’s onward who had no state help, had to work long hours and had to tolerate descrimination and intolerance, we don’t pay the highest Council Tax in Greater Manchester to fund your socialist experiments. Labour Oldham are the homeopaths of holistic politics treating like with like, the best way to treat a prevent poverty is to build new homes with ever larger numbers of bedrooms, new schools, offer community grants, thousands in family benefits, teach people to speak English if necessary implement grow your own vegetables schemes when there is not enough land to make it viable. Then we expand that poverty in those very same most deprived wards by having workingxtra schemes which treat working sixteen hours or volunteering as the modern equivalent of the traditional forty hour working week. We import and accomodate yet more of the worlds poorest migrants before blaming everyone else for housing and school shortages, NHS failures, food banks, community tensions and overcrowding. 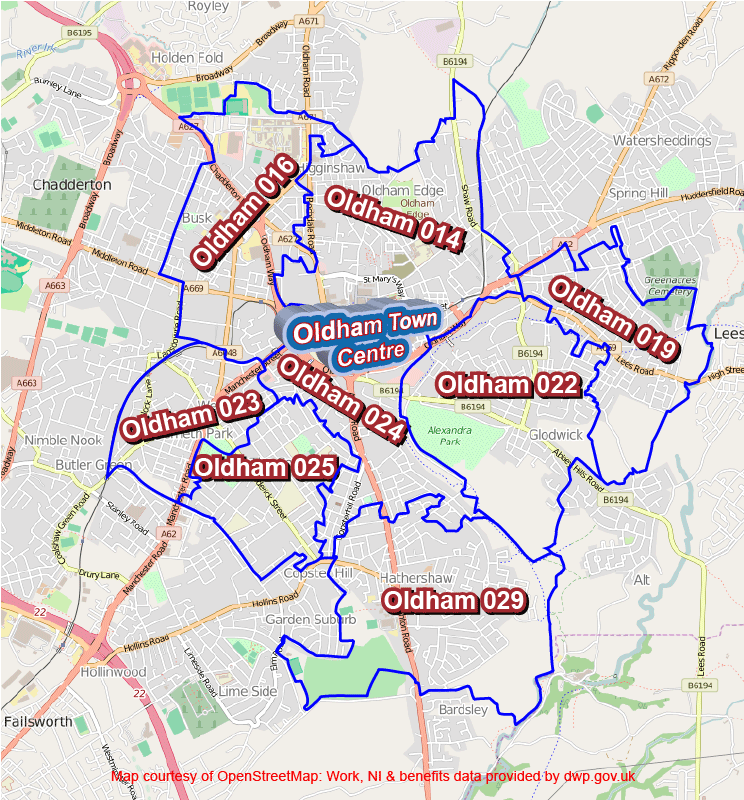 Unlike politicians we will use official Department for Works and Pensions data and statistics rather than opinion and spin to highlight just what is happening in and around Oldham Town Centre and its wards. We remain convinced that the statistics highlight one of the reasons why Oldham Council have failed to attract any private investors for their regeneration schemes and it does more than hint as to who the new housing at Prince’s Gate, which falls within this area, will be aimed at. Middle Layer Super Output Areas are designed to improve the reporting of small area statistics in England and Wales. Oldham has 34 MSOA areas these 8 surrounding Oldham Town Centre in the picture below account for 75.3% or 5830 of 7744 migrant National Insurance No registrations to adult overseas nationals entering the UK since April 2009 and 74.6% or 671 of 899 migrant NINo registrations in the first 6 months of 2015. 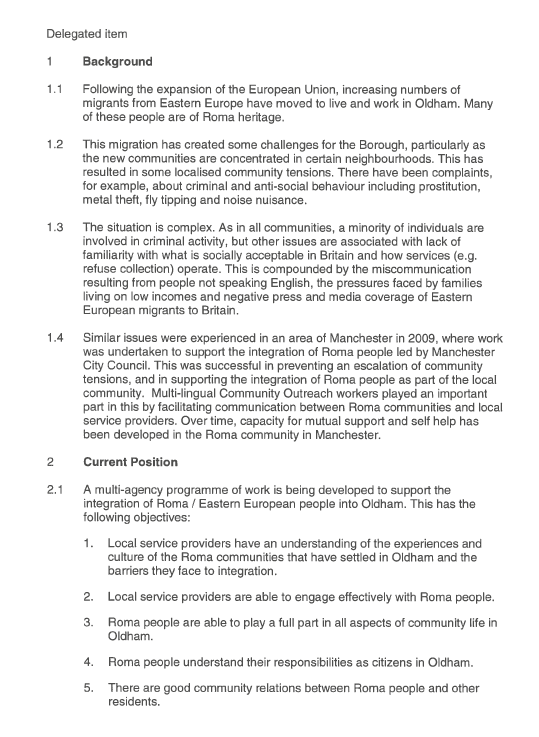 The Oldham 024 area which includes Primrose Bank and the Town Centre has 13.7% of new Oldham migrant NINO registrations in 2015. 4 of these MSOA’s make the top five list of Oldham areas with the highest Universal Credit caseload Sept 2015. 016, 014, 022 & 029. Oldham has both the highest monthly & cumulative level of Universal Credit starts of any area. Data for 023 appears to be unavailable. 3 of these MSOA’s are areas of new PFI housing 014, 023 & 024. 5 of these MSOA’s make the top ten list of Oldham areas for housing benefit claims in 2015 & 4 make the top six list for claims increases since 2011 with Oldham 024 showing the biggest increase. 3 of theses MSOA’s 014, 016 & 029 make the top five list for Employment & Support Allowance sanctions. Top 3 countries of origin by number of registrations.